American Express does a great job at engaging its cardholders with targeted discounts, social media campaigns and more. You might be familiar with its Link, Like, Love promotions, or the targeted discounts you can find in your online account that offer cash back when you shop with certain merchants. Amex has also been innovative in partnering with various other companies such as Amazon and Uber to let cardholders redeem points directly for purchases. Now, the company has launched a new payment service called Amex Express Checkout, and cardholders who use it on or before September 7, 2015 will get a $10 statement credit off their online purchase at participating merchants. When you check out, simply select Amex as your payment method and enter your account info, and the fields will populate automatically. On the plus side, while you’re limited to one $10 statement credit per Amex account, you can receive that statement once per participating merchant, so that’s up to $100 of savings per Amex card. In addition, Newegg.com sells gift cards to tons of merchants, and those gift-card purchases qualify for the $10 statement credit, so you could potentially take advantage of this for purchases you end up making elsewhere. 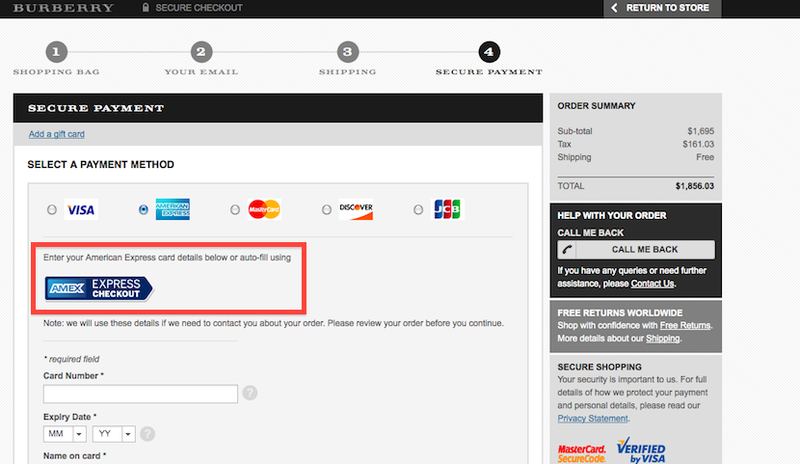 To trigger the statement credit, choose American Express as your payment method when you check out after shopping with a participating merchant online, and then look for the Amex Express Checkout button as shown on the Burberry site below. Look for the new Amex Express Checkout button when you select Amex as your payment method. You will then be prompted to enter your account login information, and all your Amex card accounts should pop up so you can select which card you’d like to use. Amex then does the work for you and populates the credit card information, billing and shipping fields, and then you’re done. Is this groundbreaking? Not really. But it’s a good chance to save a couple bucks if you were planning on making some purchases with your Amex card anyway, so you might as well take advantage. If you end up using the new service, share your experience in the comments below, and let us know how long it takes for your $10 statement credit to post to your account. For more information, see Redeeming Amex Membership Rewards Points for Maximum Value.